The first time we smoked a Thanksgiving turkey was about ten years ago. I was a bit skeptical that about smoking the turkey when we were hosting twenty people for a very traditional Thanksgiving dinner. So to be safe, I cooked one 25 lb. turkey in the Big Green Egg and another 25 lb. turkey in the oven. Just in case the smoked turkey wasn’t good, I wanted a fallback plan. It turned out the smoked turkey was so delicious we barely ate any of the turkey we baked in the oven. Since that Thanksgiving, we have smoked at least turkeys every year. And every year my husband claims this year is the best ever. So I thought it might be time to share how we smoke a turkey. We use a Big Green Egg. 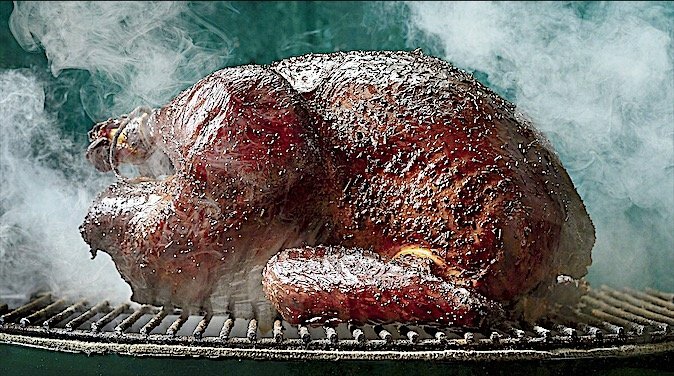 I realize there are a lot of different ways to smoke a turkey but this recipe is based on using the Green Egg. Prepare the Green Egg by filling with lump charcoal. Using a starter or igniter, light the charcoal and let burn until heat reaches a steady 300 degrees. 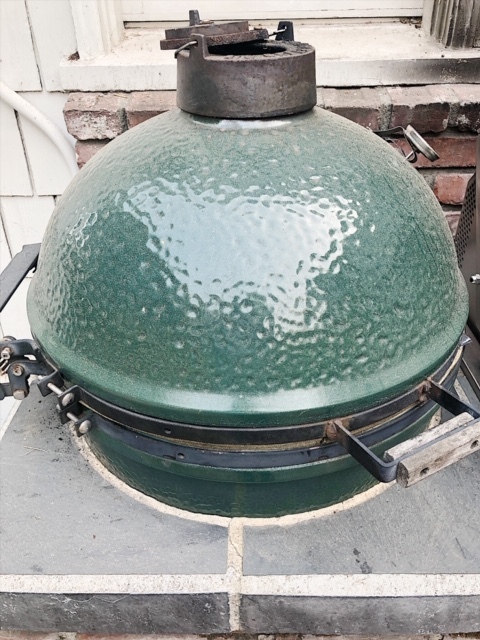 You can maintain the desired temperature by adjusting the amount of air that flows into the Green Egg through the top and side vents. The more air that is allowed in, the hotter the egg will heat. To prepare the turkey, clean it, remove the neck and giblets and pat dry with paper towels. Rub the skin lightly with melted butter. Peel and cut two whole onions into quarters and place in the turkey cavity. 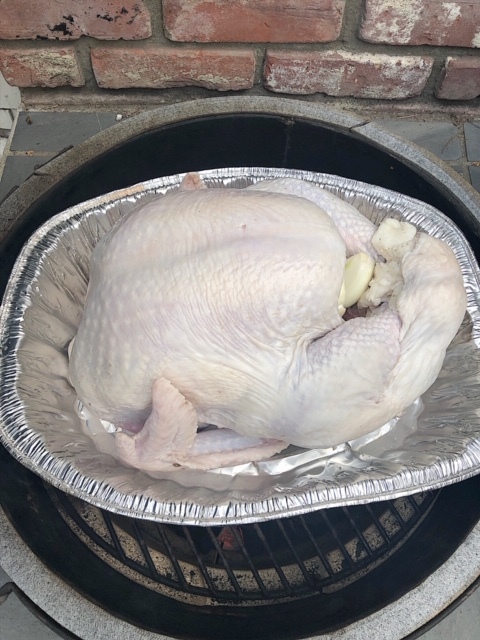 Place the turkey in a foil pan for smoking. I like to use large chunks of smoking ships. These are my favorite. 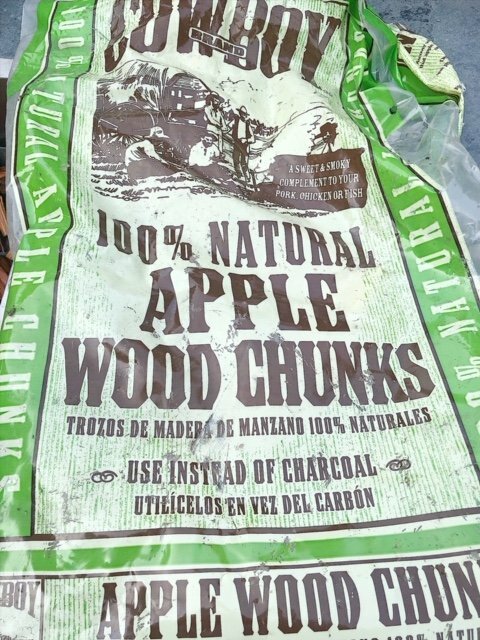 MY favorite chips are 100% apple wood chunks. 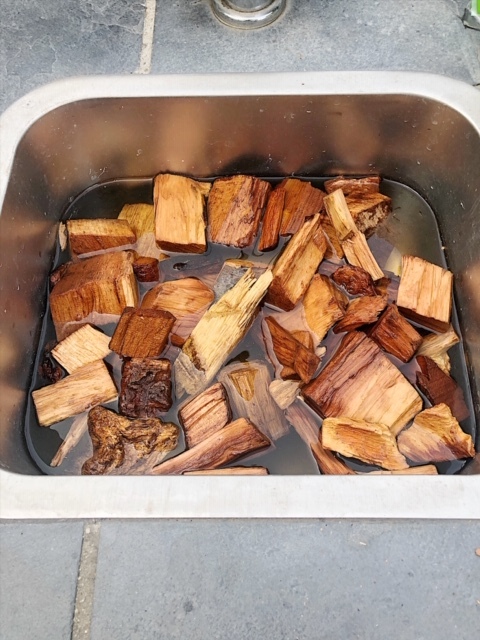 Soak the apple wood chunks in water for thirty minutes. Drain and pat dry. 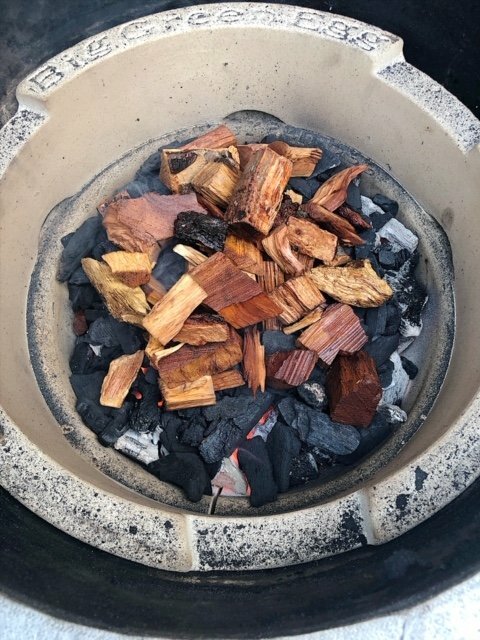 Place the soaked chips on top of the hot lump charcoal. 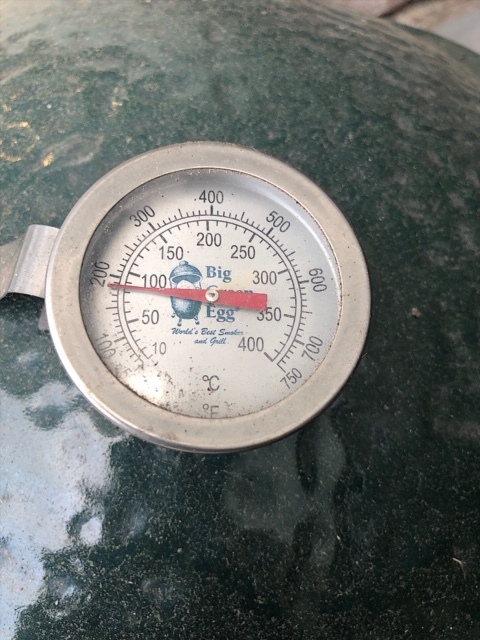 Close the Green Egg and adjust the vents so that the temperature holds at 300 degrees. 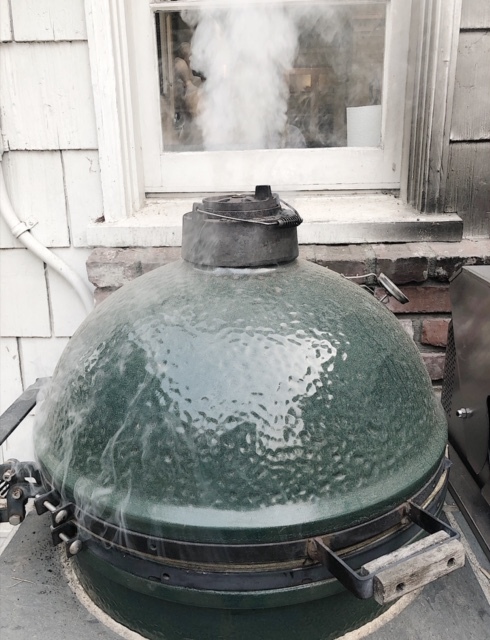 The smoke should vent through the top of the Green Egg. Allow approximately 10 minutes per pound for smoking the turkey. Usually our 26 lb. turkey cooks in about four and a half hours. Check the temperature of the turkey with a meat thermometer periodically, When it reaches about 172 degrees, take it out of the smoker. Let it sit and continue to cook until it reaches 180 degrees. This should take about half an hour. I think the secret is taking the turkey out the Green Egg when the temperature of the turkey reaches 172 degrees (not 185 degrees). If you wait too long, the turkey will overcook once you take it out of the smoker. Ok next year, I need to do this!